Just like musicians, who tune their instruments to a reference pitch before an orchestra concert, scientists need to tune their instruments to reference measurements. Without careful, precise calibration processes, measurements drift and become unreliable. Environmental sensors, like the atmospheric remote sensing radiometers that measure gases such as ozone and water vapor, require calibration from blackbody references with known physical characteristics. The next generation of calibrating devices, which will significantly improve performance and lead to more accurate measurements, involve complex geometries and precise dimensions. Scientists around the globe use desktop stereolithography 3D printing to accelerate research, lower the cost and speed up the development of advanced experimental setups, and fabricate custom scientific devices from millifluidic devices to beam splitters. Dr. Arne Schröder and the THz-Optics Group at the University of Bern Institute of Applied Physics in Switzerland, in collaboration with AME Ltd., have significantly improved the performance of new highly accurate calibration units for space and ground-based radiometry with 3D printed parts. Calibration units are built into various instruments studying the Earth’s climate. Microwave radiometers deployed all over the globe monitor atmospheric gases such as water vapor or ozone in the atmosphere. Radiometers often operate continuously to detect seasonal and annual changes in atmospheric composition, providing valuable data to climate scientists. 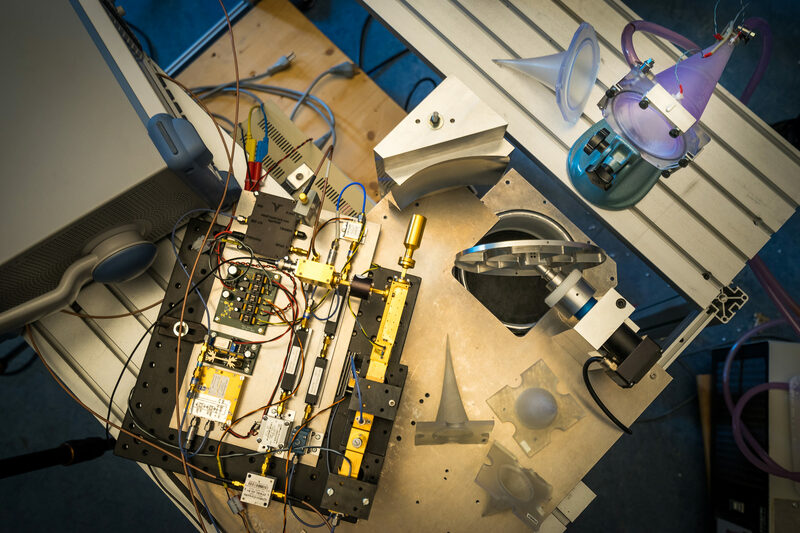 The mission of GROMOS, one of the radiometers operated by the University of Bern, is to monitor ozone distribution in the stratosphere up to a height of 65 kilometers. 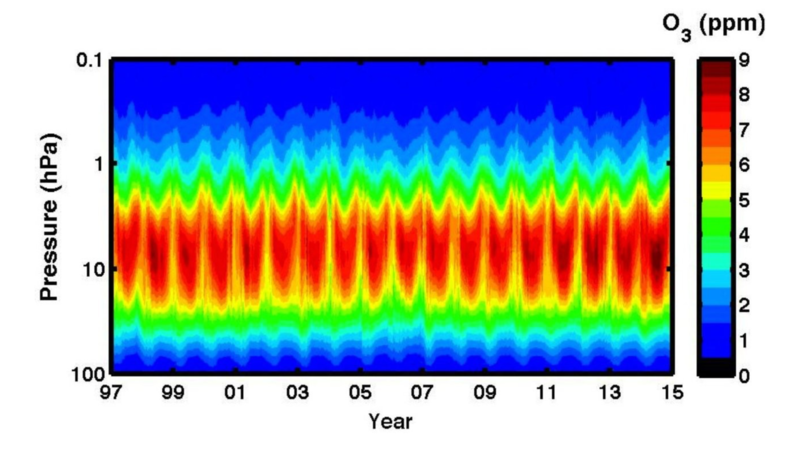 This data helps scientists understand complex climate phenomena with global impact. One such phenomenon is the so-called “sudden stratosphere warming” in the polar region during the winter, which caused massive snowstorms in North America and Europe in recent years. This graphic shows the ozone distribution over Bern, Switzerland, as measured by GROMOS. The data shows the high concentration of ozone between 26–40 kilometers above ground, with increased levels during the summer months. So, where do the calibration units come into play? They help to translate the measured radiation of atmospheric gasses into an absolute radiation temperature. The procedure is very much like calibrating a mercury thermometer. First, stick the unit into a block of ice (which is always 0 °C) and then into boiling water (which is 100 °C), and mark the height of the mercury column on the cylinder in both instances. Dividing the distance between the two marks into 100 equal intervals results in a working thermometer on the Celsius scale. Calibration units help translate measured radiation from atmospheric gasses into an absolute temperature by providing a benchmark to calibrate the telescope or radiometer. The procedure for calibrating a radiometer is very similar. First, the radiometer measures the radiated emission of a chemical species in the atmosphere. After that, the well-defined emission of two different calibration units is measured to provide a reference—just as in the analogy with ice and boiling water. “With this calibration, it is possible to determine the radiation temperature and thus the concentration of the faraway particles. This calibration procedure is repeated every few seconds, as radiometers are high-fidelity instruments which require constant calibration during operation,” said Philippe Raisin, a researcher of the project. Scientists must know the properties of the calibration units with a high degree of certainty to provide accurate results. With a mercury thermometer, one has to be sure that the ice is indeed 0 °C and the boiling water is precisely 100 °C. If these values deviate even slightly, the calibration suffers. The same concern applies to calibration units for radiometers. “To serve as accurate benchmarks, calibration units should exhibit a high microwave emissivity as well as a defined, homogeneous temperature,” said Dr. Arne Schroeder. In other words, the unit should be as black as possible in the microwave regime. Conventional calibration blackbodies often consist of absorbers made of epoxy resins and metallic support structures which reduce temperature gradients in the absorber. “Finding the best compromise between the conflicting microwave performance and the temperature distribution constitutes a major challenge in the design process of calibration units. We decided to experiment with water as the absorbing medium. Water has excellent absorbing properties, and since it’s fluid, the temperature can be controlled efficiently,” said Dr. Schröder. One main challenge remained: how could they shape a water container of a calibration unit to obtain a high performance? The scientists decided to use a conical shell to separate the water from the air. 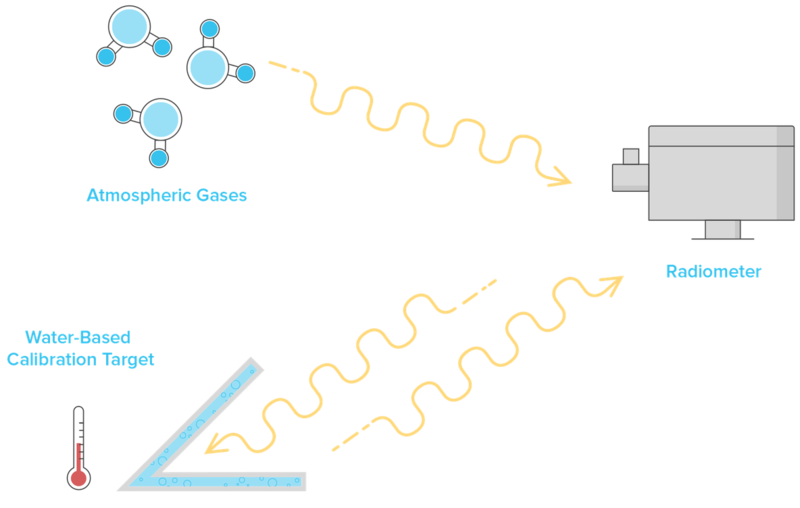 Computer simulations indicated that this would be a promising way forward, given that the separating material was transparent in the microwave regime. To test their idea, the scientists printed the first prototype shells using Clear Resin on a Formlabs stereolithography (SLA) 3D printer. “We put these shells in a water-filled jar to have a very simple water-based absorber. We conducted initial electromagnetic measurements which showed that these prototypes displayed excellent electromagnetic performance,” said Dr. Schröder. 3D model (left) and final prototype (right) of the instrument set up for upcoming measurements, with the water in- and outflow hoses, as well as temperature sensors, attached. Given the complex shape, the two cones would have been costly to manufacture with traditional tools. The second prototype consisted of two 3D printed cones, one inner shell optimized for electromagnetic absorptivity, and one outer shell around the former. The water flows in between these two cones uniformly with the help of a guidance spiral. Hoses attached to the device channel water inflow and outflow, and temperature sensors are inserted into the outer shell to monitor the temperature of the water. The test setup. The radiation from the water inside the cone hits the two mirrors and is captured by the golden cylinder. The device then measures the amount of radiation captured, which changes with the temperature of the water inside the printed cone. With a suitable calibration, the measured value can be translated into the temperature of the water. Traditional calibration units tend to have poor temperature gradients due to their low thermal conductivity, whereas water allows for a consistent temperature throughout the cone—as required for a high-performance calibration unit. The scientist examined the prototype using an existing ozone radiometer. “Instead of measuring ozone, we measured our prototype. In this experiment, we increased the water temperature step by step up to around 60 °C,” said Dr. Schröder. The temperature measured by the radiometer precisely followed the temperature measured by the sensors deployed in the water. Results of a temperature performance test. 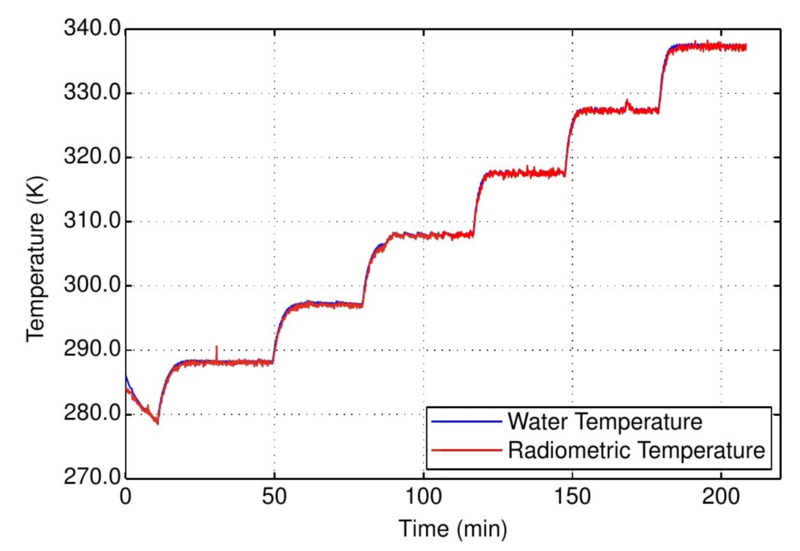 The blue line shows the temperature measured by conventional temperature sensors in the water, and the red line shows the temperature measured by the radiometer. 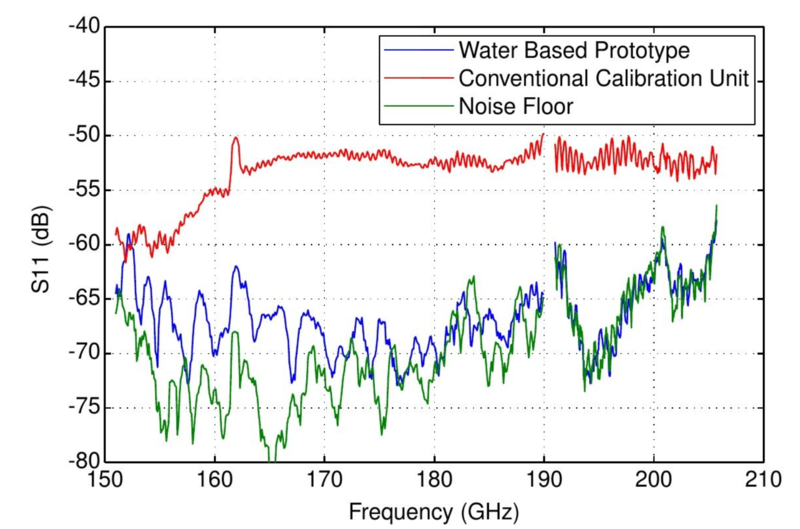 As the lines hardly deviate from each other, this experiment demonstrates the high performance of the water calibration unit. Moreover, the temperature homogeneity in the cone is within several millidegrees Celsius (m°C), a significant improvement over other targets where a difference of several hundred m°C is common. “This is a great result as it demonstrates that the water-based calibration unit meets the theoretical predictions, and even exceeds our expectations. These 3D printed calibration units can be produced much faster and at least five times cheaper than commercial calibration units with comparable performance,” said Dr. Schröder. Performance test of the 3D printed absorber (blue), compared to a reference absorber (red). The lower the line, the better the performance. The green line denotes the detection limit of the setup—even if the absorber was better, the test setup could no longer measure it. Microwave radiometers are not only ground-based devices but are also integral parts of satellites looking inwards at the Earth or out in the Universe. While a water-based device is not suitable for the environment in outer space, the development of calibration units for space instruments can profit from the water-based calibration units. Soon enough, new instruments developed based on the Swiss research group’s learnings will help scientists explore our planet, as well as planets orbiting distant stars. 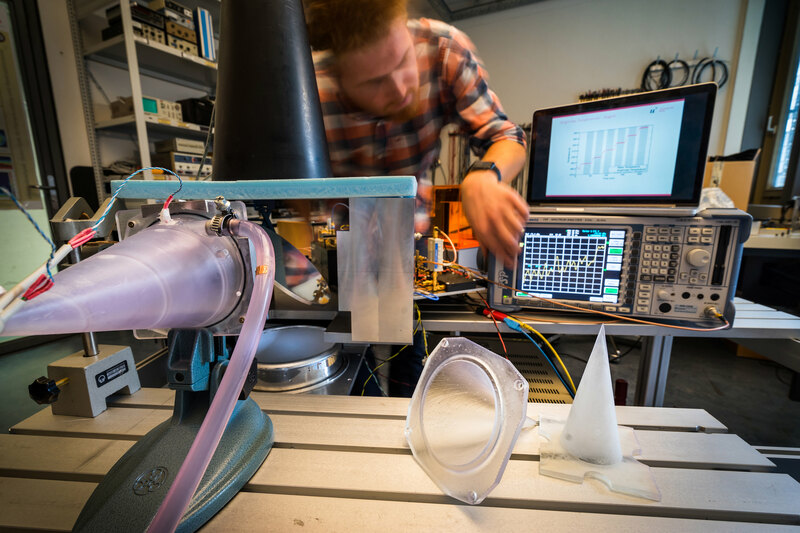 Rapid prototyping with 3D printing allowed Dr. Schröder and his team to create various iterations of water calibration units to perform fast experimental validation and study of theoretical designs. Stereolithography 3D printing helps to lower the costs and speed up the development process, and empowers researchers to efficiently test novel designs which would be impossible to create with traditional manufacturing methods and materials.